"Unless we put medical freedom into the constitution, the time will come when medicine will organize into an undercover dictatorship....The Constitution of this Republic shall make special provision for medical freedom as well as religious freedom." 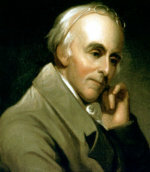 Dr. Benjamin Rush, founding father and signer of the Declaration of Independence. It appears that, unfortunately, the other signers didn't have the foresight that Benjamin Rush did.